Still here, still alive. Four days of mad tweeting, begging, and cajoling. Most of the begging and the cajoling though has taken places in the last three weeks. In case you were wondering, ENT works. 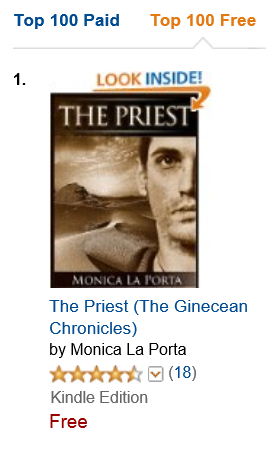 Meanwhile, I discovered that on Wednesday The Priest was featured on Freebooksy. Compared to yesterday’s ride, downloads are slowing down now, but numbers are still looking good. I reached #1 in Dystopian, #2 in Science Fiction/Action, and also top 100 bestsellers list. 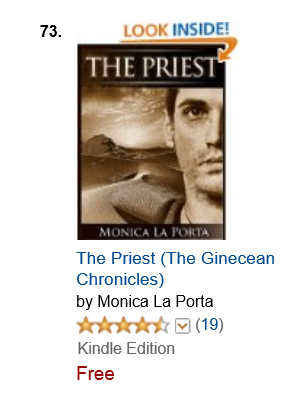 Plus, today the Priest has received three 5* reviews on Amazon. Two more have appeared after the first one that prompted me to write the ode to awesome reviewers. Cara Monica, so happy you’re having the success you deserve! I’ll be leaving a review for you soon too, since I just nabbed a free copy! : D Congrats on the fantastic numbers! Angela, thank you so much!